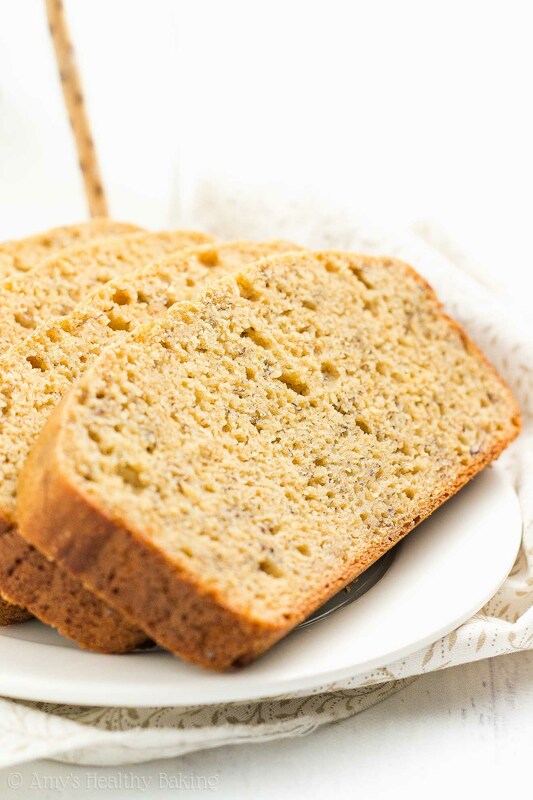 Learn how to make healthy banana bread with this easy recipe! It’s really tender, full of sweet fruit flavor & only 120 calories! In the beginning of my senior year of high school, my mom began buying all sorts of healthy food at the grocery store. Since my brother and I both brought brown bag lunches, she wanted to ensure we had plenty of nutritious options to choose from. Carrots, celery, bell peppers, granola bars, yogurt, whole wheat bread, lean lunch meat, cheese, apples, bananas, oranges, grapes… We loved helping her unpack the weekend grocery hauls to see what delicious foods we could eat during the upcoming week! However, we didn’t always finish off all of the healthy items, especially the fresh fruit, often because Mom bought a few extra pieces just to be safe. That usually meant we ended up with a couple very ripe and brown bananas on the counter. So for the first month of school, I baked a fresh loaf of banana bread every week! I followed the recipe in one of our well-worn cookbooks from around the time my parents got married (it may have even been a wedding gift! ), which meant that it called for plenty of oil and sugar… But it always tasted incredible! 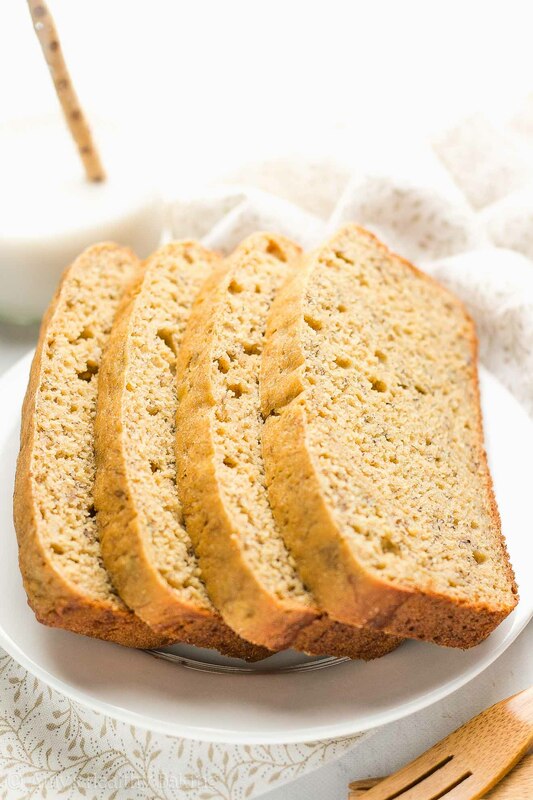 Over the years, I’ve tried to create my own healthier recipe that tasted just as perfect, sweet, and cozy… And I finally did with this Ultimate Healthy Banana Bread! 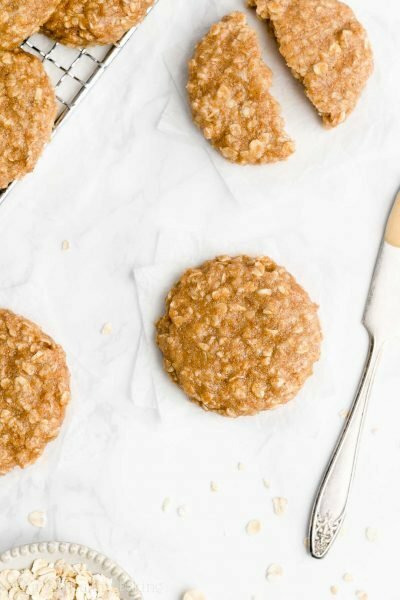 It has the same fruity flavor and supremely tender texture, but my version has no refined flour or sugar—and only 120 calories! You’ll use white whole wheat flour (like this!) to make this healthy banana bread! No, it’s not a combination of white (aka all-purpose) flour and regular whole wheat flour… White whole wheat flour is made by finely grinding a special type of white wheat (hence the name! ), whereas regular whole wheat flour comes from a heartier variety of red wheat. 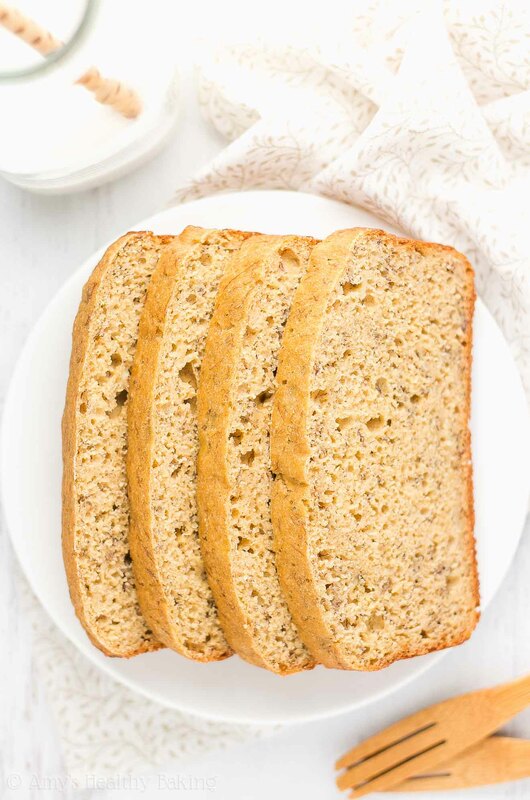 This gives white whole wheat flour all of the same health benefits as regular whole wheat flour, like extra fiber, but it also gives white whole wheat flour a lighter taste and texture. That lets this recipe’s tender texture and banana flavor really shine! Not exactly surprising, but the bananas truly are the key to making good banana bread. You must use very ripe bananas! The ones with more brown spots than yellow are ideal. See the ones below? That’s the minimum amount of brown I recommend. More is even better! That’s because the brown bananas have a stronger flavor and more natural sweetness than their pure yellow friends. 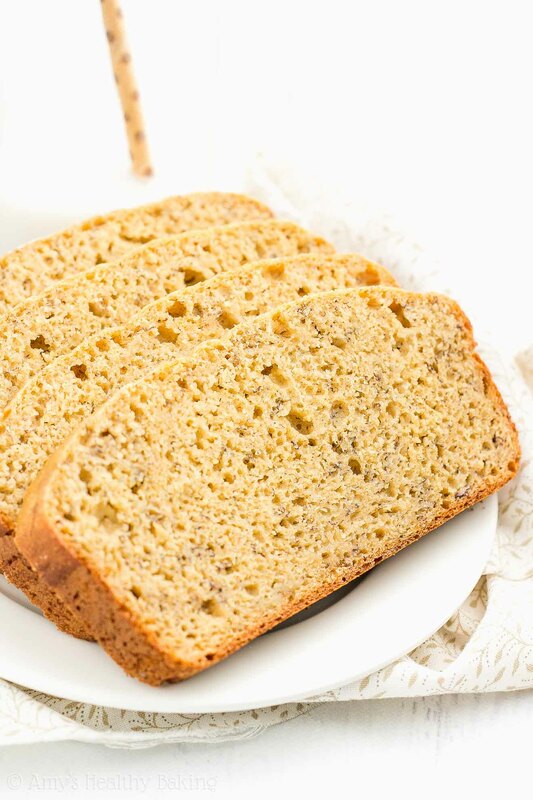 If you use yellow bananas or yellow bananas with a few brown spots, your banana bread will taste bland. I promise it’s worth waiting for your bananas to turn extremely brown and speckled! Tip: As long as you use those really ripe bananas, you’ll only need to add a touch of pure maple syrup (like this!) to boost the natural sweetness. Guess what? The bananas not only provide flavor and sweetness… They also help with the tender texture! Yet another reason why ripe bananas are best. The pure yellow ones are much starchier, so they won’t produce the same tender texture. Because you’re just using ½ tablespoon of butter or coconut oil, it’s really important to use those supremely ripe bananas! Can you tell I’m a huge fan of ripe bananas yet? You’ll also mix in some Greek yogurt to boost the tender texture! I love baking with Greek yogurt because it adds the same moisture to your batter as extra butter or oil but for a fraction of the calories… And it gives your baked treats a protein boost, too! It’s vinegar! Just a teensy tiny amount. I promise you can’t taste it! 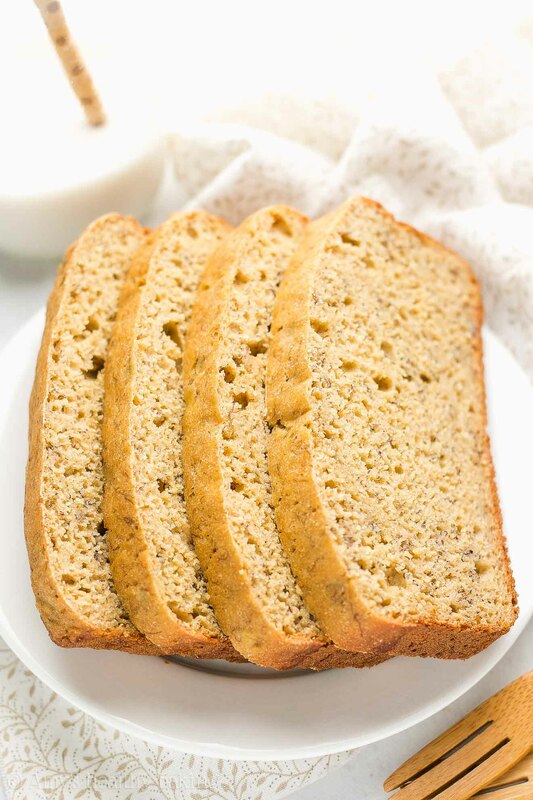 The vinegar is a key ingredient because its acid reacts with the baking soda, which helps the banana bread rise better and also helps with the tender texture. I love kitchen chemistry! Have you ever baked a loaf of banana bread, pulled it out of the oven, and came back to the kitchen 5 minutes later… Only to realize it sunk as it cooled? Such a bummer! That happened to me the first time I tested this recipe, so I figured out 3 ways to combat that and ensure your banana bread stays nice and tall. 1) An extra egg white. Okay, so not quite part of the “baking method,” but it’s still important to the structure! Egg whites contain lots of protein. Protein is the number one thing that makes baked goods hold their shape once they’ve come out of the oven and while they cool. You must use all 3 egg whites! 2) Lower baking temperature. Another reason baked goods sink as they cool is because they haven’t fully cooked through in the center. If you slice into banana bread and notice a thin slightly gooey-looking line above the bottom crust, that’s the evidence! (For the record, I actually love that part… But I assumed not everyone is odd like me! ?) 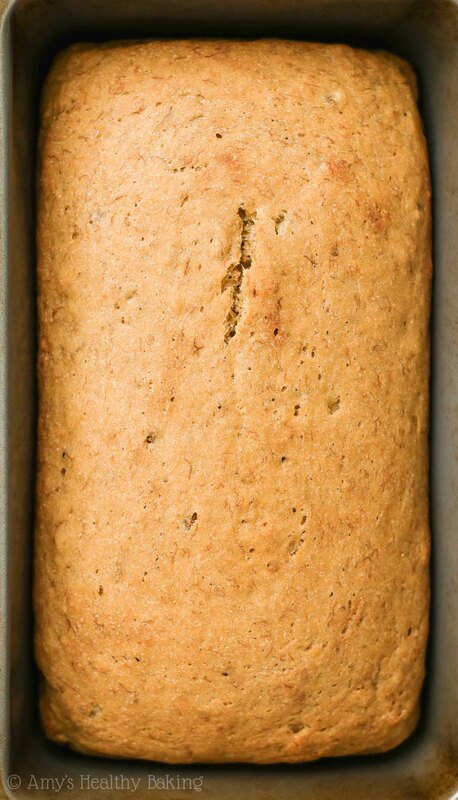 So we’re baking this banana bread at 325°F instead of 350°F so the center can cook all the way through without the sides turning really brown or burning. 3) Foil on top. With the lower baking temperature, the banana bread needs to stay in the oven longer in order to cook all the way through. But… Leaving it in the oven longer can result in an overly brown or burnt top! The foil acts as a shield, preventing that burned top, while still allowing the center to keep cooking through. Partway through baking, you’ll quickly remove the foil and immediately pop the pan back in the oven. (Act FAST! If you take too long, your loaf will start to sink!) Removing the foil allows the center to turn a nice golden brown during the last part of baking. Last one! For the best texture, you must wait until the banana bread has fully cooled before slicing into it. The center is still “setting” while it cools, so cutting into it before the center is at room temperature isn’t a good idea. However! 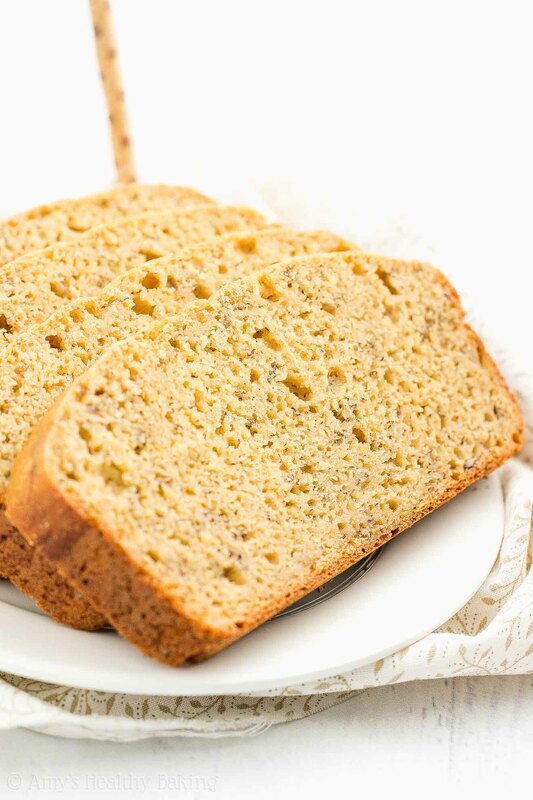 Once the sides of your banana bread feels like it’s at room temperature, you can pop the loaf in the fridge until the bottom feels chilled to speed up the cooling process. Whew! Lots of kitchen chemistry… But one absolutely perfect loaf of healthy banana bread! ♡ And when you make your own, remember to snap a picture and share it on Instagram using #amyshealthybaking and tagging @amyshealthybaking IN the photo itself! (That guarantees I’ll see your picture! ?) I’d love to see your banana bread! This truly is the best banana bread I’ve ever had! It’s so tender and full of bright fruit flavor. It’ll keep for at least one week if stored in the refrigerator in an airtight container or tightly wrapped in plastic wrap (this kind is my favorite!). Preheat the oven to 325°F. Lightly coat a 9x5” loaf pan with nonstick cooking spray. Spread the batter into the prepared pan. Cover the top with foil, and try to push up the foil in the center to ensure it doesn’t touch the batter while baking. Bake covered at 325°F for 35 minutes. Acting very quickly, remove the pan from the oven, and remove the foil. Immediately put the pan back in the oven, and continue baking the banana bread for an additional 28-32 minutes (for a total of 63-67 minutes) or until a toothpick inserted into the center comes out clean. Cool in the pan for 10 minutes before carefully transferring to a wire rack to cool completely. 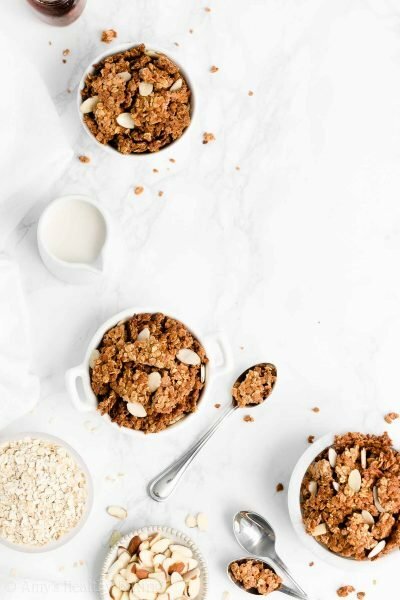 Notes: For the gluten-free flour, use as follows: 1 cup (120g) millet flour, ¾ cup (90g) tapioca flour, ½ cup (60g) brown rice flour, and 2 teaspoons xanthan gum. Many store-bought gluten-free flour blends (like this one!) will also work, if measured like this. Whole wheat pastry flour, regular whole wheat flour or all-purpose flour may be substituted for the white whole wheat flour. Make sure you measure the flour correctly, using this method or a kitchen scale. (← That's the one I own and love!) Too much flour will make your banana bread turn out dry and bland. 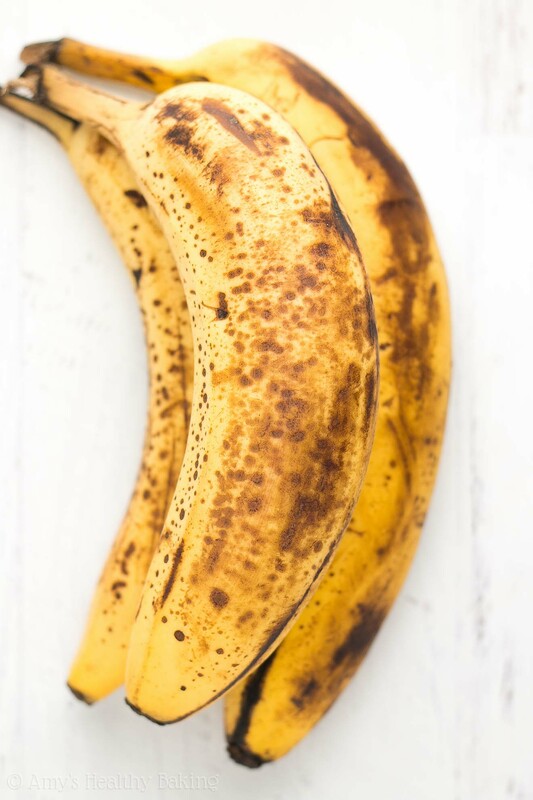 For best results, use the ripest, darkest, most spottiest bananas you can find! The ones with more brown color than yellow are ideal. (See my photo in the blog post above for reference!) Measure the bananas by cups or grams. Not all “medium” bananas are the same size! The mashed banana and Greek yogurt combined need to measure 1 ¼ cups. If you have slightly more than 1 cup mashed banana, then reduce the Greek yogurt by the same amount, and vice versa. Honey or agave may be substituted for the maple syrup. For a sweeter-tasting banana bread, substitute 1-3 tablespoons of pure maple syrup for an equal amount of milk. You must cover the batter with foil during the first stage of baking. This allows the center to cook through without the top turning overly brown or burnt. Work very quickly when removing the foil! If you leave the pan out of the oven for too long, the loaf will start to collapse, and it won’t recover to fully rise properly. For more information, read the tips in my blog post above and watch my video directly above the recipe! 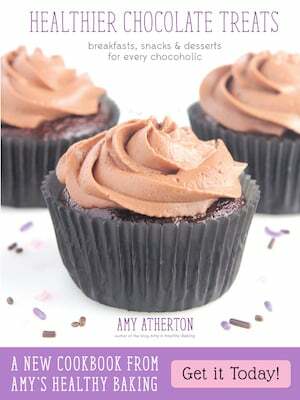 ♡ …and the rest of Amy’s healthy banana bread recipes! baked this bread this morning and I guess it was my oven the bottom was hard, but, the taste was great..Baked 35 min on 325 removed foil and baked for 28 min s more. Will decrease time after foil removed to 15 to 20 minutes. Will try again. I have an electric stove, used the middle rack with a metal nonstick pan and no other sheet. I think my oven cooks too high I will adjust the time. Hi Amy! I made this 2 hours ago. The taste is wonderful, but my banana bread didn’t rise as much as yours 🙁 I literally followed every step of the recipe, and when it was in the oven it actually rose very well. But when I took it out of the oven and let it rest, I saw that my banana bread collapsed, like really. I wonder what caused this? I want to make this recipe again cause it tastes amazing, but I want it to rise beautifully! If you could answer this I’d really appreciate it ? I measured the mashed banana by cups and I didn’t make any modifications. I baked it exactly 35 minutes with foil, and baked 30 minutes more without the foil. And when i cut it, it actually looked raw in the middle, but i thought an hour of baking was enough. It might be because of my oven’s performance. Do you think I should’ve kept it in the oven for another 10-15 minutes? Thanks for the information, Dilara! If the middle was raw, then that’s why it collapsed. It wasn’t finished baking! So yes — I definitely think you should leave it in the oven longer so it fully finishes baking. Remember to use the toothpick test, just like in Step 3, to make sure it’s done! 🙂 Does your oven run cool, by any chance? If it does, that’s probably why your banana bread didn’t finish baking in the correct amount of time! I have tried many of your recipes, from muffins to cookies to breads. I love them all! It’s fantastic how low in fat they are, while being high in protein. 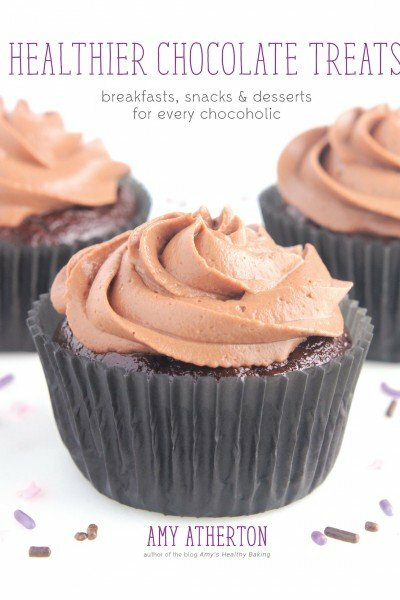 The one issue I’ve run into is that as they are written, your recipes are never sweet enough for my sweet tooth! I have solved this in muffins by taking out the milk altogether and adding sugar. However, In other recipes, such as breads and scones (my attempt at your pineapple coconut scones was atrocious; it didn’t rise at all!) this does not work. 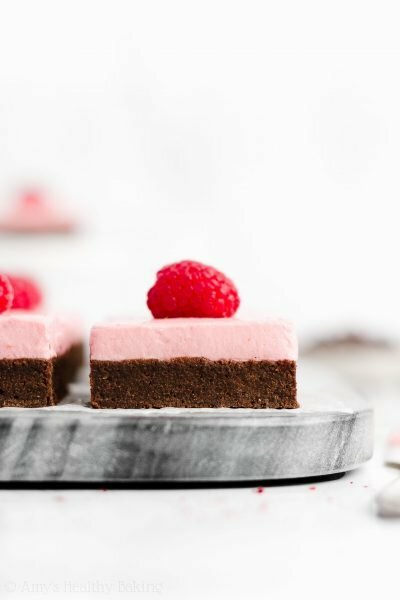 I have no knowledge of baking chemistry and was hoping you could assist me on a more reliable way to introduce more sweetness into your recipes without disrupting the balance of ingredients needed to ensure proper rising. I would also love it if you could explain the logic behind these substitutions so that I can better understand the chemistry of what I’m baking and be better equipped to troubleshoot when necessary. I really appreciate your interest in my recipes Amelia! That means a lot to me! 🙂 Unfortunately, as you’ve found out, the chemistry actually does depend on and vary with each type of recipe, so it’s really hard to give a blanket generalization. However, for my scone recipes, you can make them sweeter by replacing some or all of the milk with additional maple syrup, honey, or agave. 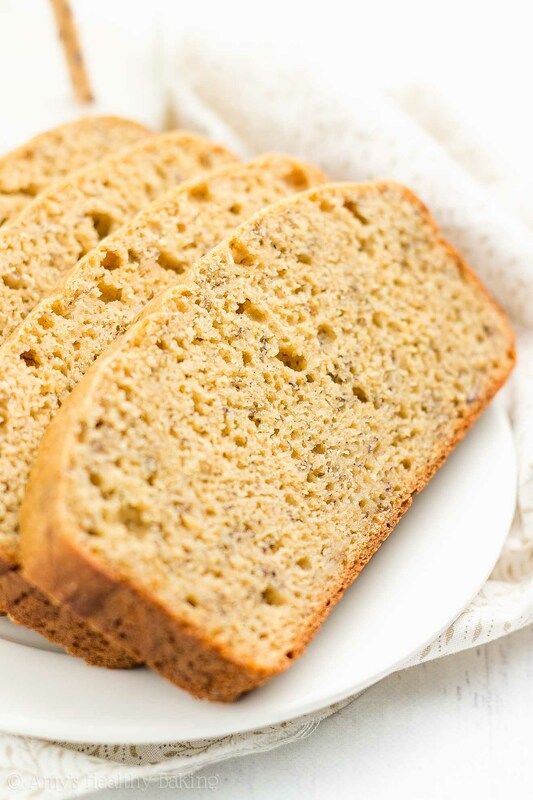 This generally works for quick breads (like this banana bread!) as well. 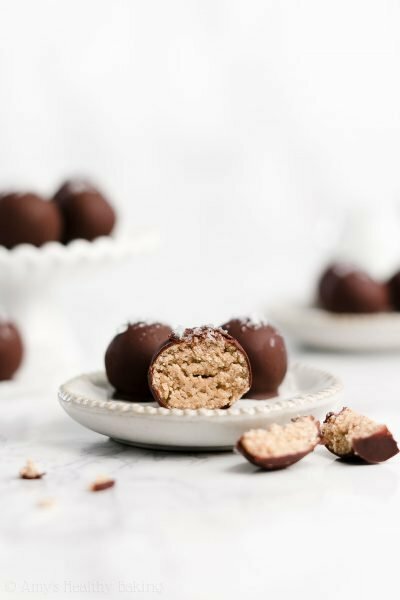 I’m also happy to help you on with individual recipes — just leave me a comment on the exact recipe that you’d like to make sweeter (and include the sweetener you want to use, like granulated sugar or maple syrup or whatnot! ), and I’ll give you the best options! 🙂 I can’t wait to hear what you decide to try next! I won’t rate the recipe, because I did not follow it exactly, but just want to warn others—unless you follow the recipe absolutely word for word, the results are awful. The change I made was combine all purpose white flour with whole wheat flour (yup, I know Amy said not to do that but that’s what I had on hand). Then I followed everything else exactly. The result was a dry bread, not sweet at all (even though I substituted 3 tbsp of milk with 3 tbsp of maple syrup), completely stuck to the pan, so it broke in half when I tried to take it out. So no complaints, I did not follow the instructions precisely, but wanted to let others know that they shouldn’t expect a great result unless they do.